After two days of torrential rains another river overflowed into the city of Osaki in Japan today, destroying homes and fields and stranding at least 60 people, according to media reports in Japan. 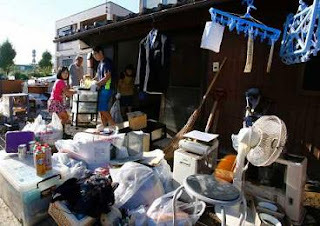 A family clean up the mess left by flooding in Shimotsuma, near Joso, Ibaraki prefecture, north of Tokyo, today. 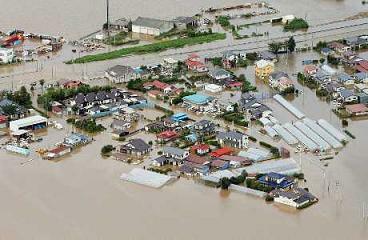 Rapidly-rising waters in the city of 60,000 people led to a series of dramatic rescues by helicopters yesterday. A district government in China is giving dog owners a stark choice: get rid of your pets or we'll come to your home and kill them on the spot. Even in a country where dog ownership is tightly regulated, the order issued this week by the Dayang New District in the eastern city of Jinan is extreme. Dayang's order also covers dogs that have been registered and vaccinated. Culls often follow outbreaks of rabies, a disease that kills about 2,000 Chinese each year, but the order cites only the maintenance of environmental hygiene and “everyone's normal lives'' as reasons. People who answered calls today at the district government office said no one was available to discuss the matter. However, an unidentified worker from the Dayang village committee interviewed by a local television station insisted the order was the will of the majority of the district's more than 1,000 residents. “Dogs are always defecating all over the place and bothering people. A lot of people were complaining so we wrote a public notice to avoid a conflict,'' the man said. The order underscores continuing weaknesses in China's legal system, particularly when it comes to police powers and private property protections. It also points to the lack of rules on pets in public, such as leash laws and fines for not cleaning up after them.